Featuring a more upright brim with a bit more depth to it, the Broadbrim allows a little more protection to the shoulders, neck and chest as well as the face and head. It’s a classic style with a modern edge thanks to its stripes of stitch detailing on the brim and luxe fabric in go-with-everything neutrals and subtle patterns. 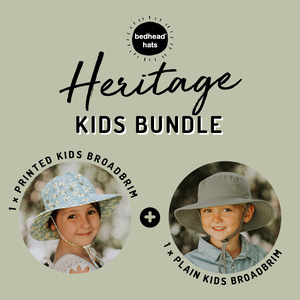 In a soft, stretchy cotton woven fabric with 8-way stretch technology, the hat allows for growth and that much-loved, comfortable Bedhead fit every time. All of our hats are rated UPF50+ excellent protection.